Manager Derek McInnes felt Aberdeen's performance at Tynecastle should have been enough to secure a win rather than a draw against Hearts. 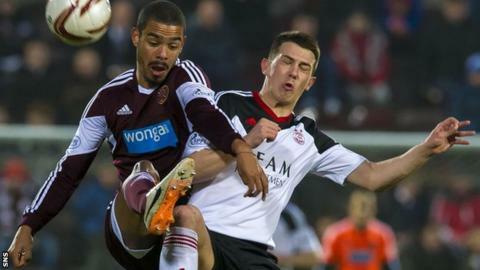 And McInnes was "not convinced" Shaleum Logan's challenge on Callum Paterson merited the penalty that gave Hearts their equaliser. "I don't think the referee's got a good position to see it clearly," McInnes told BBC Radio Scotland. "There's enough there to make him make a decision, I understand that." Willo Flood's free-kick put the Dons ahead after Hearts captain Danny Wilson had been sent off for picking up a second yellow card. But Hamill levelled from 12 yards with three minutes left. "We bossed and dominated a game here tonight up until the last five or ten minutes," said McInnes. "We had so many real opportunities and good situations that we could've made more of. "We're culpable in not showing enough quality in those situations to go and get ourselves that second and even third goal. "It was a performance that I was really pleased with up until the last five minutes when we just allowed Hearts to get back in the game. "They put two up, credit to Hearts for that. They got roared on by the crowd and we knew we weren't going to get it easy here. "They got the ball forward hoping that something would drop for them and that's exactly what happened with the penalty kick. "I commend Hearts certainly for the last five, ten minutes of the game but we should be talking about a good three points for us on the back of a good performance because it was a good performance." Though McInnes's side reclaimed second place in the Scottish Premiership, they are only ahead of Motherwell on goal difference. And, with the top flight's post-split fixtures being announced earlier, Aberdeen know they will face the Steelmen at Pittodrie on the final day of their league campaign. "We are determined to finish in that second spot if we can but we'll finish where we deserve to finish," added McInnes. "We just want to make sure we're not looking back on this evening's result, that it might have cost us maybe a place in Europe. "We've just got to make sure we focus on the good from tonight and take that into Hibs on Monday night."